Tap Settings > Mail, Contacts, Calendars >Add account. In the Add Account page, tap Other > Add Mail Account. Enter your name, full email address, your password, and change the description if you want. Tap Next. Depending on your account, select IMAP or POP and add the following.NOTE: The mail app may fill in the correct incoming and outgoing mail settings for you. If it doesn’t and you don’t know the necessary server settings to complete these steps, contact your email provider. User Name Type your email address. 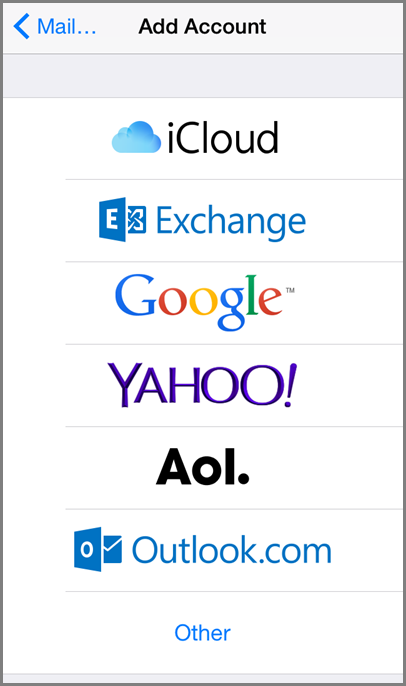 Host Name Type your outgoing mail server name. For example, the outgoing server name for Office 365 is: mail. [YOURDOMAIN.com].